Shennongjia is located in Fangxian County, which is in western Hubei Province, roughly an area of 3,250 square kilometres. On average, over 1000 meters above sea level, there are six peaks measuring 3,000 meters above sea level, known as "The Roof Of Central China." In the area close to the summit, exists a great variety of white animals such as white bears, white deers, white rats, white snakes, white monkeys. Places like this are few in China if not in the rest of the world. HONG KONG --An investigation has been launched in Hubei, China after six people claimed to have spotted the Chinese Wild Man of Shennongjia. The 5 foot 5 inch, grey-skinned human-like figure, which had shoulder-length black hair and crooked arms and back, was seen walking across a road. The Wild Man of Shennongjia, a Yeti-like creature, is said to live in the mountainous forests of Hubei Province. The six people who saw the creature were traveling in a vehicle in the Shennongjia Nature Reserve, reports the Hong Kong edition of China Daily. One of the witnesses, Shang Zhengmin, a local reporter, said they saw the beast as they turned a corner on a mountain road. He said the "ape-like" animal was moving fast on the road and by the time the vehicle finished the turn, it had disappeared. Passengers got out of the vehicle and found several 12 inch footprints, newly broken branches and a large patch of "foul smelling urine-like liquid" on the road. Dozens of sightings of the Wild Man have been reported in the area and China organized several searches during the 1980s and 1990s but to no avail. June 30, 2003 15:08 IST--An 'ape-like' beast nearly 1.65 meters tall has been sighted in the forests of central China, a media report on Monday said. The grayish 'mythical ape-like animal', suspected by locals to be a 'bigfoot', was reported to have shoulder-length black hair, it said. 'Bigfoot' is more commonly known as the 'Yeti', a mythical beast partly human and part animal, has remained an unsolved mystery of the Himalayas. The name Yeti is derived from 'the rock living animal' ('Yah' means rock and 'thi' means animal in Sherpa), and is popularly known as 'the abominable snowman' in the West. Chinese wildlife officials have launched an investigation after apparent sightings of the mysterious animal on by six people, including a reporter from the local broadcasting station, in Shennongjia nature reserve in Hubei province on Sunday, Xinhua news agency reported. Shang Zhengmin, the reporter, and five others were on the way back to Songbai town from Muyu town when they sighted the creature. When their vehicle took a left turn along the mountain road, four of them saw an ape-like animal moving rapidly on the road. But as the vehicle finished the turn, the animal had disappeared. The passengers found several 30 centimetre-long footprints and newly broken branches in the jungle near the area where the animal was reportedly seen. They claim to have discovered a three-meter-long patch of foul smelling urine-like liquid. 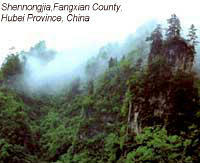 Hundreds of local people have reported 'bigfoot' sightings over the past decades in the Shennongjia area. China has organized several high-profile searches for the unidentified animal through the 1980s and 1990s, but no hard evidence has been found. yesterday afternoon, the Xinhua news agency reported. The reserve is well known as a place where local legend has it that the half-man, half-ape creatures live. Several years ago, China's state press said scientists had unearthed hundreds of fossilized teeth of giant apes in the area, with some speculating that Bigfoot could be a descendant of such primates. The latest sighting was described as a grayish "mythical ape-like animal," 1.65 meters tall with shoulder-length black hair. One of the witnesses, Shang Zhengmin, a local reporter on the way back to Songbai town from an interview in Muyu town with five local people, said they saw the beast when they took a left turn along a mountain road. road. They also claimed to have discovered a patch of "foul smelling urine-like liquid" on the road where the creature was seen. Xinhua said an investigation was underway. time it may have left a urine sample. Six people, one a radio reporter, say they saw the "mythical ape-like animal" in central China's Shennongjia Nature Reserve, the official Xinhua News Agency said today. Xinhua referred to it as a "Bigfoot," after the legendary North American ape-man. More than 100 sightings of the creature have been reported in Shennongjia in the forested mountains of Hubei province about 1,200 kilometres southwest of Beijing. The latest witnesses were in a Jeep on a mountain road yesterday when they saw the grey creature moving quickly away from the road, Xinhua reported. It said the creature was about 1.65 metres tall and had shoulder-length black hair. The witnesses found several footprints 30 centimetres long, freshly broken branches and a "three-metre-long patch of foul-smelling urine-like liquid," Xinhua said. The sighting was reported to authorities and "an investigation is in full swing," the report said. It said one of the witnesses was Shang Zhengmin, a reporter for a local radio station. The others were residents. At least three scientific expeditions in Shennongjia have searched for evidence of the creature's existence. Researchers said they found hair that didn't match either humans or known animals, but no other evidence has been reported. Sightings of a similar creature have been reported in Tibet, although its existence hasn't been proven either. Back to Newspaper and Magazine Articles?